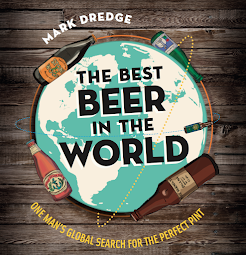 Mark Dredge - Beer: The beers are on me! I haven’t stopped smiling for about 10 hours now. Literally. Winning the British Guild of Beer Writers New Media Writer of the Year is a big deal to me. I guess, considering the award, I should’ve announced it via a tweet but Pete Brown (Beer Writer of the Year, deservedly) and Dave (runner up in New Media) got there first, so I’ll just blog it instead. I get up at 5am every day to write about beer because I love doing it. To be rewarded for something you love is just a fantastic feeling. To be rewarded for my skills as a writer (whether it’s 1,000 word blog posts or 140 character tweets) is even better. I felt that I’d made a transition beyond ‘beer blogger’ a while ago and now I can officially say that I am an Award Winning Beer Writer! I like that. The award ceremony was excellent. Nice food, superb beer pairings, good people. Pretty much a triumph all round, I’d say (apart from the tankards not making it down to the hotel!). Now I need to try and work out the best way to spend the prize money. Lauren has requested £100 of it for putting up with me but I laughed that off straight away. I’ve already checked out flight costs to the US and I think I’ll be heading over there early in the New Year (when’s Pliny the Younger released?!). I’ll pop across to Belgium too. And maybe GABF in September. Maybe Italy. Definitely a little tour of UK breweries… Seems I might need to start saving a little extra of my own for all this!! I’ll be in London all day drinking. If you are around then let me know (tweet, comment, email, whatever). I might buy you a beer. how ever you choose to spend the prize money i am sure you will enjoy it! I hope that you're going to tell me, whenever you are coming down to Italy. Congrats. Definitely deserved! I've definitely enjoyed reading P&S for that past few months or so! Congratulations, Mark! You've put a lot of work in on this lark (5am is insane, really), so it's a just reward. "How old does a medium have to be before it's not "new" any more? :D"
Congrats Mark. Only been a follower of the blog for a couple of months but it's always fun to read and very well researched and written. Good work Mark, very well done indeed! Well done mate. Enjoy your writing. Come up to Aberdeen once Brewdog open their pub. Well deserved fella. Not only does your blog's enthusiasm make for infectious reading but you're also a thoroughly nice bloke! You know you want to spend the money (how much are we talking here) on a trip to Portland, OR. If you do, I may have to come with! Well done mate, you can tell you put everything into this blog. Always makes for great reading. Enjoy the prize and keep up the good work! Excellent! Congratulations on the well deserved recognition. Congratulations on a thoroughly deserved win. You've even got me to break my silence (first ever comment despite reading for "ages") to say so. Your freshness and enthusiasm for the subject doesn't exactly give beer-blogging the kick up its arse it deserves, mainly because it's not been around long enough to need it, but is still very welcome. I look forward to reading how you drink the prize money. Great stuff! I have been following your blog for quite a while now and find it a quality read, far superior to my own. You should write a book it would be quality. Well done mate! The beer blogging world it definitely far richer for having yourself and Dave in it! couldnt think of a more derserving person. I want to know how you can drink beer AND get up at 5am. I'll buy you a beer next time you're out this way Mark - well done. Here's another long time reader that is writing for the first time: You deserved it. Well done. Congratulations! I said to Ann when I entered that if I get beten by anybody I hope it's by Mark Dredge. Dreams can come true. Well done and lets hope this is the first of many. Well done Mark. Mine's a pint of tasty session ale. I'd like to congratulate you. I really would. Congratulations Mark, on this well-deserved reward. I've only been a follower of your Blog for a few weeks, but I've always enjoyed reading your posts. If you are ever in this part of Kent, get in touch so that we can sink a few beers together. ps, is there such a time as 5am??? Well done Mark. Love reading your blog. It's a well deserved award. Hope you get to make those beer trips so we can all read about them! By the way, if you go to Belgium you really must combine that with a visit to Amsterdam (I think you've now met Ron judging by the photo on Jeffery's Blog), and from there to Bodegraven and the compulsory De Molen visit. Look forwad to seeing you in Manchester when you make journey up here to the grim north. Thank you for these comments everyone, they are wonderful to read and very humbling. I hope that my joy at writing comes across in my work but it really wouldn't be what it is without readers, so cheers to you all!! ah - just spotted this. Well done fella.